You don't have to hide unwanted veins on your face, chest or legs anymore. With an experienced practitioner and the Cutera® Nd:YAG laser, you can get rid of veins from tiny red ones on the face to blue spider veins on the legs, safely, effectively, and without the use of needles. The Cutera® combines the ideal laser wavelength for veins, with the most control of parameters, to deliver the best vascular laser system on the market. 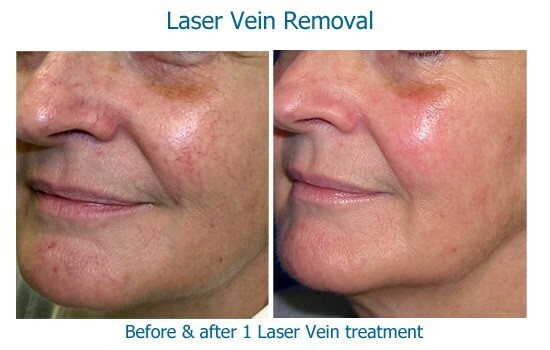 The laser works by delivering a pulse of energy that momentarily heats the blood inside the vein. This heat is enough to damage the vein walls which are then reabsorbed by your body slowly over the weeks following treatment. 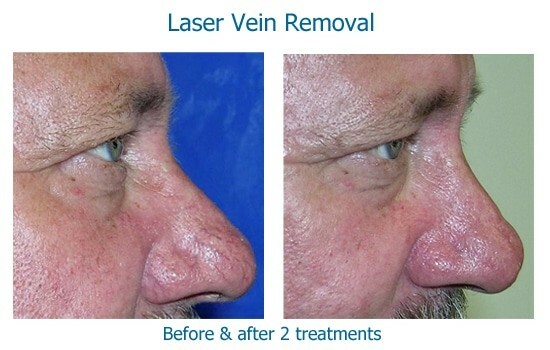 Small, facial veins can be removed quickly, sometimes with just a single treatment. Spider veins and moderate size (up to 3 mm wide) blue-green leg veins can also be treated with excellent results. Varicose veins which usually look knotty or are bulging outward, are best treated by a vascular surgeon. 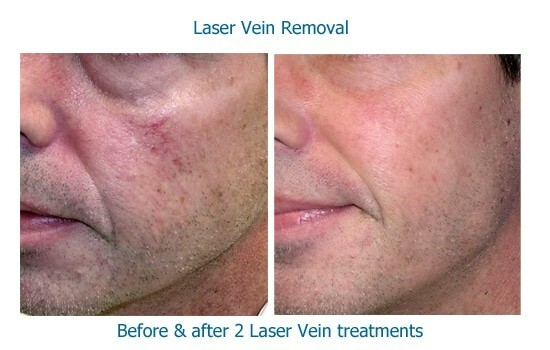 The laser tip is cold which helps protect the skin and decrease the mild stinging produced by the treatment. Most people who have had sclerotherapy or cauterization of veins in the past report that laser vein therapy is a much less uncomfortable experience. There's no discomfort after a treatment although some redness and sometimes swelling over the veins may occur. Treated veins on the face may disappear immediately while red and blue leg veins will still be visible over several weeks after a treatment until they reabsorb. Larger greenish leg veins can take up to 12 weeks to fade. 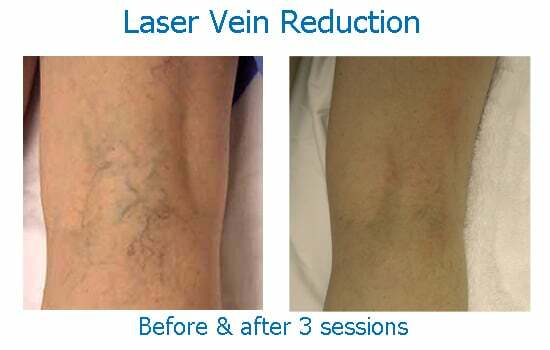 Occasional some bruising occurs from laser vein treatments but much less frequently than with sclerotherapy. Rarely, when bruising occurs with larger vein treatments, a tan or brownish area of pigmentation may persist that can be faded with IPL treatments. Patients often find that one or two treatments are sufficient for most unwanted facial veins on the cheeks and chin, although nasal veins may require several treatments. Unless they're caused by underlying venous disease, an average of three treatments will effectively reduce most treated spider veins on the legs. Some spider veins are the result of deeper vein problems and may not respond to either laser treatments or sclerotherapy. Signs of deeper vein problems requiring more extensive treatments and are best evaluated by consulting a vascular surgeon, are a lot of blue veins on the feet and ankles, starburst clusters of veins where multiple veins radiate out from the center, and veins found on the inside of the knees. Call Skinspirations soon 727-571-1923 or register online here for a complimentary consultation to learn whether laser vein therapy can reduce your unwanted veins.